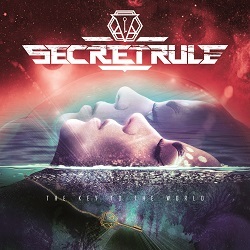 Italian Symphonic Metal band SECRET RULE release their 3rd studio album today on PRIDE & JOY MUSIC! “The Key To The World” so far has been received well by the press & radio alike. During the next couple of months, the band around singer Angela Di Vicenzo will heavily support this release live at dates with KOBRA & THE LOTUS, XANDRIA, SERENITY and as headliner plus on festivals. Please find the tour poster and a full list of shows below. SECRET RULE was formed in the beginning of 2014 with the intention to create a special sound with powerful rhythms and catchy melodies. The band is fronted by the powerful voice of Angela Di Vincenzo (Kyla Moyl), masterminded by lead guitarist Andy Menario (Martiria) who has worked with big names such as Vinny Appice (Black Sabbath, Dio), Jeff Pilson (Dokken, Foreigner), and Carlos Cavazo (Quiet Riot). The line-up is completed by bassist Michele Raspanti (Graal) and drummer Nicola Corrente (Enemynside, Stick it out, Starkiller Sound). Early in 2017 SECRET RULE supported Blaze Bayley for some gigs and then started to work on new material. The new album “The Key to the World” will be released by Pride & Joy Music on November 10th, 2017. 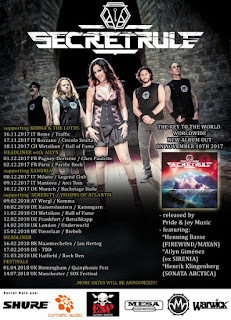 Henrik Klingenberg (Sonata Arctica) and two new guests on this new CD, Henning Basse (Firewind and MaYan) and Ailyn Giménez (ex Sirenia), also appear on this third release of the band. It again was mixed and mastered by Tue Madsen (Antfarm Studio- Denmark); Fabio D’amore (Serenity) handled the pre-production and Simona Speedy Saccoccia took care of the artwork again. In addition, music videos for the tracks “Twin Flames”, “The Song Of The Universe” & “Imaginary World” feat. all three guests were released in advance to the album release.